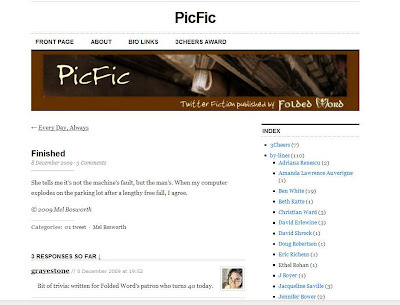 Two of my tweets were published today at PicFic. Finished and Every Day, Always are dedicated to a birthday boy 3,000 miles away. Ooh. Fancy new look. I like it. K's psyched to make your blog, even. He says he had a GREAT birthday. Nice, Mel. AND I just saw my tag ("fan of smooth faces") -- Hysterical. yeah! ha ha! congrats, eric. These were both great, man. Such economy and purpose. Loaded. Congrats. Fantastic. You're a repeat offender. Loved these. thanks, cynthia. sometimes it's okay to be a repeat offender. don't worry. i also hate the word "blog." feels like i should be doing something quirky or something. like talking on a hamburger phone.